Cupcakes 'n Daisies: Tootin' My Horn . . . . . . The Cadillac of tables! Now, I am having even more quilter's envy! LOL You should get a discount from Horn's for the great promo!! Makes me want to run out and buy one! That is a great review! And the cupholder puts the cherry on the sundae! Or should I say cupcake? No wonder you are so productive - your setup is certainly conducive to it! Thank you so much for answering my question about the table. You have a great sewing room and table. I just love, love that table! I would die to have one of those, but don't have the room. But it's just so perfect. And the added addition of the cup holder certainly doesn't hurt, does it? Wow Thelma! What a great table. I have never seen this model before. When we were looking for a table for my machine, we ended up with a Koala, which I love. Your table is so versatile because it doubles as a cutting table too. Two for one! Great! Good Lord! I want one!!! Lol that is the ultimate table for sure! Wow, your workspace is amazing, I love how large and functional it is. If I got one of these for a present, I think it would be number one! What a great table. Thank you for describing all of the features. And you're right, the cupholder is genius!! Best stop buying so much fabric and start saving for one of these babies instead. Okay, the whole hydraulic lift sucked me in. I'm thinking I need one of these babies ASAP. Thanks for sharing with us. I love it. I see so many sewing tables out there and never know if it will suit my needs. This is simple and to the point. Fabulous table - I've seen them but never sure how they worked. I had a Horn cabinet for years and the lift for my machine was my favorite part. So very nice. My husband bought me a koala a few years ago. So glad you enjoy it. The lifts are nice becuase you get a nice large space to work on. That is one nice table! Horn should put you on commission for this. Wow! That looks so great! I would love the smooth big sewing surface for quilting!! What a great sewing table! I have never heard of this. Great table! And Cooper is looking good. Oh my word this is the best EVER!!! What a great hubby you have. I am off to check out the site. It's absolutely the perfect sewing table. Thanks for sharing all the features....and so nice to find your blog! You have convinced me!! I have a few questions. Does the acrylic insert come with it? You just tell them what kind of machine you have and they send along the right size insert? What about the melamine insert when you lower the machine? Do you just store it somewhere until you want the entire surface to be even? Does the machine come all the way to the surface when you want to change the bobbin? My local Bernina shop usually has a huge sale every May when they offer everything at 30% off. I know what I'm getting this year! Thanks for the sewing table info. I may just check that out for when I move. That is one terrific table. I'm positively green with envy! my sewing table is an old door. What a great table Thelma! I haven't seen that one before. I love seeing your sweet pooch in the pics to demonstrate the differences in height! And yes, Starbucks delivered would be the only thing more perfect! - maybe you could buy him one of those fully automatic coffee machines (the ones that grind the beans, pour the coffee and even do the milk and stuff) - that way if DH likes good coffe, he will think you got him a really good present - and you won't have to worry about the fact that Starbucks don't deliver! Actually that cup holder is not as silly/funny as I first thought - it is actually quite a clever idea having a cup holder that swings out from under the table and is just below table height - if one still somehow managed to knock over one's cup of coffee with one's elbow/etc (I am sure I would find a way ;-) then it would most likely spill on the floor - not all over the table and whatever sewing/etc you have spread out all over it. btw - Cooper looks like a really nice dog! I love the table. So many nice features. Thanks so much for sharing the review and the website. Thelma, What an amazing piece of furniture. The ultimate sewing table!!! One of these days, when I have a sewing room and don't have to set up in my small living room for the winter, then back downstairs to the family room in the summer, I will definitely be getting one of those. But...right now, since I have to invade our living space to sew, I'll just have to dream about it. Great review though, and I also loved Cooper's part in your demonstration. Thanks!!! 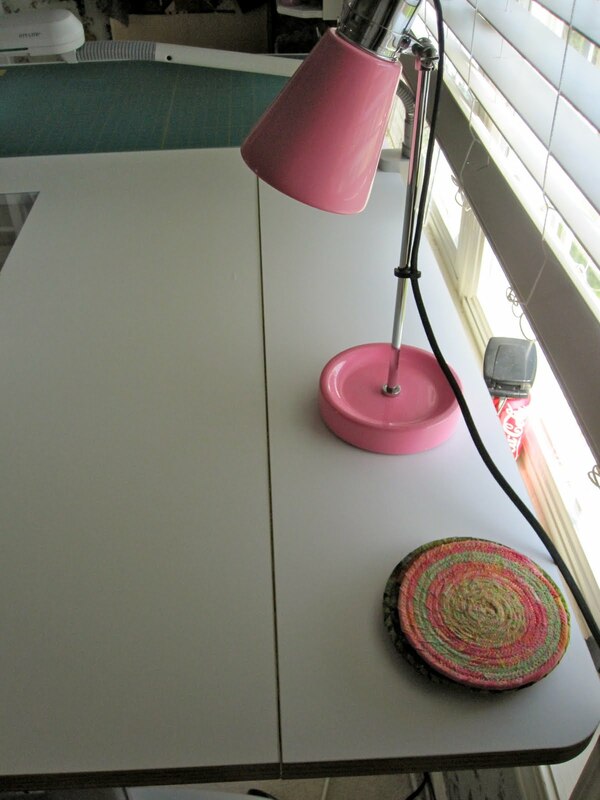 I wanted to tell you thanks for posting about your sewing table! I was in the market for a table in May and walked into a local sewing shop where they had the 3000 for sale. I had never seen these Horn tables before and was instantly excited. I have a small room that I was converting into a sewing room (moving out of the dining room - Yea!) and had little space for both a sewing machine cabinet/table and a cutting table. A two-in-one and my problem was solved! Your blog was the only information I could find at the time regarding opinions and experience with it. I found it extremely helpful in making my final decision. I am so happy with my table - absolutely love it! Quilting is even more fun because of it! Thank you again!